This album was conceived and produced back in the 90s, with the help of many producers and friends. It was never properly released and 100 copies only were ever produced. However, the tracks released back then, were different as the Artist explains, as he worked on the tracks for a long time and had different mixes for each track. Thus the first copies burned and sold around had earlier versions of the tracks, and as time passed by he changed the mixes contained on that scarcely available release. So it is for the first time that Virtuart gathered all the best mixes ever done for these tracks and authorised their official release. The second part of the album contains rare and unreleased tracks judiciously collected for this release. 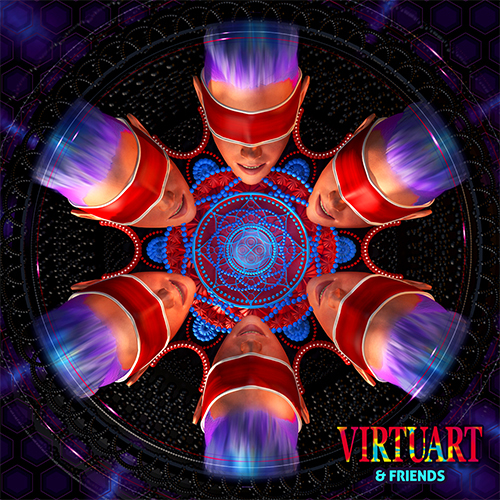 A Virtuart & Friends Volume 2 did exist but it was just given away to a bunch of friends, and never released or sold anywhere. A few tracks were changed of the original tracklist, as they were licensed and released during the years but DAT Records tried to keep it as faithful as possible to the original vision of Virtuart. The music was splendidly mastered by Jaro @ Analog Dimensions, following direct rules on limiting compression, no loudness, and trying to keep the sound as organic and oldschool as possible, still giving it much more clarity, depth and polishing all the frequencies for your aural enjoyment. Marvellous artwork accompany the release, courtesy of genius Miro Moric, who re-interpreted the original idea of Olivier, giving us a shining coloured modern version of it. A terrific release that will rock the dance floors around the world for many years to come. Don’t miss it!